I like a good sausage pasta. I’ve done them with basil and ricotta, with cabbage, as a carbonara and with beans of course. Let’s face it, you can throw anything together and not be disappointed, especially with good quality sausages. I chose this one whilst flicking through August’s Good Food mag. Heat some oil in a pan and fry the sausage meat until starting to crisp, breaking it down as you go. Remove from the pan. Add a little more oil if required then add the onion, garlic and fennel and cook gently until softened. Cook the pasta. When it has a couple of minutes left, throw in the courgette ribbons. Add the zest and juice of the lemon to the onion mixture along with some mascarpone and seasoning. Stir well, adding a little pasta water if required. Drain the pasta and add to the mixture along with the sausage meat. Stir well. 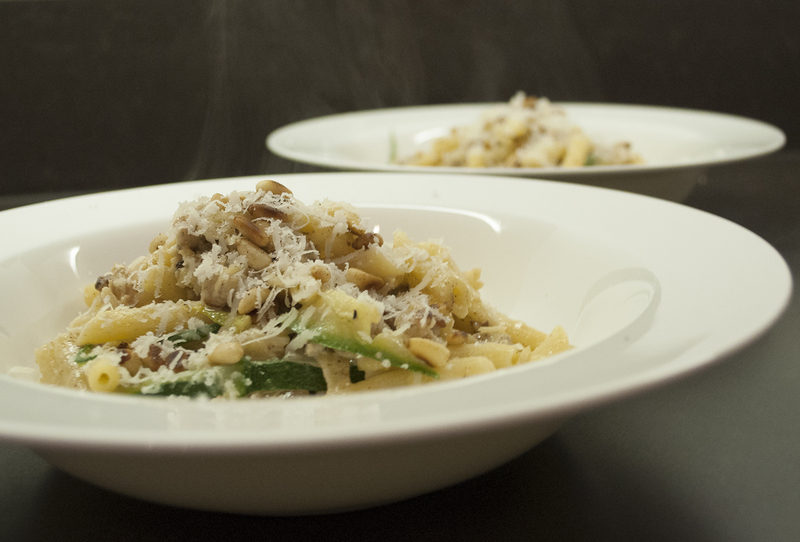 Serve topped with the pine nuts and parmesan. If you’d like the original recipe, it’s here. I have made something very similar. It always surprises me when people balk at using zucchini – it’s such a versatile vegetable!! !